This is from September 2016. Newly found, recently published. I was having a conversation with my daughter about time in the car driving back from a hike at Mt. Hood recently. She was asking how long it was going to take to get home, “you said 15 minutes … 15 minutes ago”. I told her that sometimes time feels slow and sometimes time feels fast. When I was running the day prior on the Pacific Crest Trail back to Frog Lake from Timothy Lake I was closing in on mile 30 or 34 (my watch was misbehaving) and I was trying to estimate time-to-car and time to a cold drink and the sliced watermelon that I had in the cooler waiting for me. The trail seemed to just keep going. There was an aspect of expectation (I’m close to eating watermelon), and the unknown of distance remaining to get to the watermelon. I was running hard, driving and pressing as one does when the finish is close… and time stretched. So much that I looked across the tree line and thought I saw the road. There was no road. I stopped briefly, my heart pounding, and strained my ears in the direction of the the road. Just the wind, and then silence. Just once I second-guessed direction and distance and considered that maybe I had taken the wrong trail, maybe I would never reach the road; that maybe I’m another 30 miles to the next road. I reached my hand back to lift the underside of my hydration bladder, took stock of my remaining rice cakes and concluded that yes, I could run another 30 miles to reach a different road. In 2 weeks I’m running Mountain Lakes 100, my first 100 mile ultramarathon. 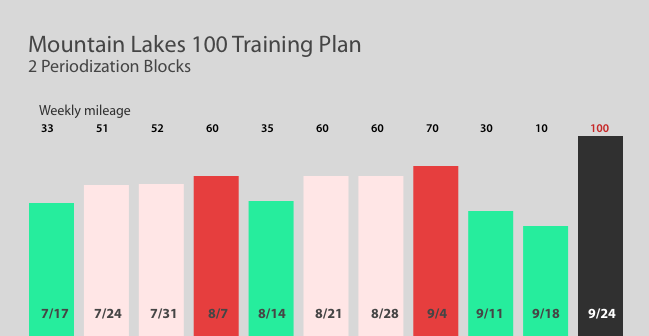 My taper has started and I’m beginning to reduce my weekly mileage from a high of 70 miles and a very deliberate periodization schedule of increasing mileage and intensity. As I walked around downtown Portland eating a burritto as I power-walked, I concluded that training for an ultramarathon is like having a second job. I also concluded that I’m ready. I’ve worked hard, I’m as fit as I’ve ever been. I’ve been waking most mornings not sore or tired from the previous day’s workout, but feeling relaxed and rested. As the day gets closer and my recovery times hover near 0 hours (from upwards of 90 hours following my hard workouts), I’m keeping in mind to simply trust the time I’ve put in – the hours on the trails, the lunchtimes spent in the gym lifting, foam rolling instead of eating dessert. I’m beginning to get into the mental state necessary to run 100 miles. I’m thinking about the words sanguine and sisu. I’m thinking about The Art of War and the 9 situations: specifically #9 – Desperate Ground and creating a situation where you put yourself on desperate ground. Deliberately. I’m looking forward to going to that place where you just dig and dig. I’m thinking about sitting with the pain… and then letting it go. Forcing a smile to reset. And I feel gratitude that I’m able to attempt this effort.